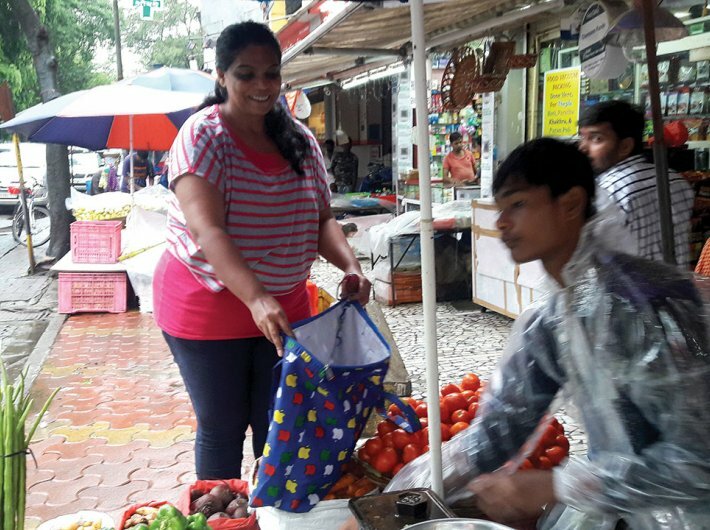 When the Maharashtra government imposed a state-wide ban on the use of plastic on June 23, Avadesh Kushwaha, a vegetable and fruit vendor in Vile Parle, had a mixed feeling about it. Though he was happy with the move and knew it would benefit people in the long run, yet he was a little worried if the ban would impact his business. However, his fears were put to rest as most of his customers started getting cloth bags with them since the imposition of the ban. “Past one week, 90 percent of the customers have been carrying their own bags. Only office-goers who return late in the evening from work ask for bags,” he says. A happy Kushwaha gives all the credit to the awareness campaigns being held in the area against the usage of plastic bags. The vendors and customers have more or less stopped using plastic bags. “In April, Mahila Sangh Karyakartas under the Swachh Parle Abhiyan told us to stop using plastic bags and switch to newspapers, brown paper and cloth bags,” he says. Read: PET bottle: Is it boon or bane? On June 23, Maharashtra CM Devendra Fadnavis imposed a state-wide ban plastic, including single-use disposable items. The ban has been enforced after the state government issued the Maharashtra plastic and thermocol products (manufacture, usage, sale, transport, handling, and storage) notification in March. A three-month timeline was given to manufacturers, distributors and consumers to dispose of their existing stock and come up with alternatives. The state government’s sustained awareness campaign throughout Maharashtra has made the citizens aware about the menace of plastic pollution. The Brihanmumbai Municipal Corporation (BMC) had even organised an exhibition at NSCI, Worli to showcase eco-friendly alternatives to plastic. Happy with the plastic ban, Jal Ram Jadhav, a vendor, says that the government was earning by imposing heavy taxes on plastic manufacturers; now it will earn from other sources in line with its programme. “Once I had a fight with an NGO representative who told us to stop using plastic. I had told them to first stop manufacturing the plastic,” he says. Ganji Bhai, a daily-provision store owner who sells grains, pulses, namkeen, etc. in 200 micron plastic pouches, says that nowadays customers are fussy and want only packed stuff – unlike earlier when grains were sold loose. “After the ban, 80 percent customers carry their own bags. If the plastic is not available they will get used to it,” he says. But there is one problem. Ganji Bhai says that while the move is very good, the government should have provided alternative solutions before implementing such rules. “We will have a meeting of shop owners, traders, etc. soon and will decide the future course of action,” he says. Supporting the ban, some state-owned and private food stores and markets like Sahakari Bhandar, Star Bazaar, and Godrej Nature’s Basket have switched to brown paper bags and bio-degradable plastic bags since March. They have also started selling cloth bags at nominal prices at their outlets. Chaudhary further says that though some people will get adversely affected by the ban, yet largely people are in its favour. “We have deployed a large number of inspectors. On Sunday [June 24], we inspected 8,500 shops; 59 shops were using banned items. We are happy people are complying with the law. The government is serious about implementing the law,” she says. With the ban in effect, the BMC will levy a fine of Rs 5,000 for the first offence, Rs 1,000 fine for the second time and Rs 25,000 for every subsequent violation and a three-month jail term.